Government officials’ wanting to sound “green,” rather than science and common sense, seems to be behind the growing number of restrictions on West Marin’s woodstoves. (In fact, a number of environmentalists have complained that the new restrictions on woodstoves are actually un-environmental, for they encourage the use of fossil fuels for heating while restricting the use of a renewable resource.) 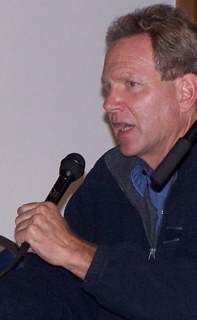 Two months ago I wrote Marin County Supervisor Steve Kinsey about my concerns, and this week he “belatedly” responded to my comments and answered questions for this blog. On Jan. 20, I had written: As a constituent, I’m asking that you and the Board of Supervisors speak out against the broad-bush limits on woodstoves proposed by the Bay Area Air Quality Management District. [The county has a seat on the district’s governing board.] As I’m sure you recall, in 2003 you shepherded an ordinance through the board that required us to replace our woodstoves with EPA-approved versions by 2008. At that time, I objected in The Point Reyes Light that what might be needed in the San Geronimo Valley was clearly not needed in windy areas. As was reported here last May, a recognizable apparition of Jesus (or is it Moammar Khadafy?) 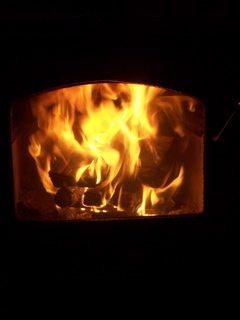 appears from time to time on the glass door of my woodstove after there’s been a fire. Whoever he is, he’s clearly saddened by what the world of his woodstove is coming to. 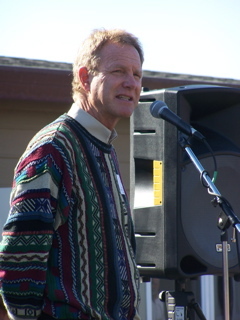 Despite published objections from environmentalists such as Mark Dowie and Michael Stocker, from The Light, and from others, the ordinance passed without making allowances for parts of the county where it isn’t needed, such as in Point Reyes Station. So as a good citizen of Marin County, I spent more than $4,000 last year to replace my Franklin stove with an EPA-approved model. Now along comes the Bay Area Air Quality Management District and proposes banning the use of woodstoves on the West Marin coast if there is air pollution in, for example, Oakland. Why should smoke building up somewhere that’s a mountain range and a large bay away keep people from using EPA-approved woodstoves in rural areas along the coast from Sonoma to San Mateo counties? Doesn’t the County of Marin, which has already made rural residents spend thousands of dollars on EPA-rated stoves, now have an obligation to defend the use of those stoves? From a strictly financial standpoint, heating with propane or electricity is enormously more expensive than with wood. I fear the Air Management District board has the provincialism of those hooked up to natural gas. Because of storms each winter, there is always plenty of firewood for sale here, making fallen trees a resource rather than a disposal problem. On the other hand, there are heavy environmental costs from the refining and transporting of propane, the damming rivers and using fossil-fueled plants to create electricity. So as a constituent, I am asking that the County of Marin — after forcing us to install expensive, EPA-approved woodstoves — will now secure an exemption from the Air Management District’s proposed ban on heating with wood on bad-air days. It would not be difficult, to determine which parts of the Bay Area have inversion-layer problems and which don’t. If everyone wanted to, the problem areas could be overlaid on zoning maps the way the Coastal Zone is. The district previously said it had the equipment to monitor air anywhere it was requested to do so, so this is not an extravagant suggestion. Forcing hundreds of thousands of people to unnecessarily stop heating with wood in cold weather is extravagant. To me, it seems only fair that county government take a stand after already making us spend more money than most of us can easily afford. Nor would it be healthy to force families who can’t afford expensive heating to shiver through cold days because 75 miles away some town has an inversion layer. Supervisor Kinsey (left) responded: The issue of windy areas is one I researched we researched when we were considering the County ordinance five years ago. The BAAQMD and others provided us with clear information that pollution created in Marin ends up impacting the East Bay and the Central Valley. I believe that if all counties and cities act together we can substantially reduce air pollution in the region, as well as addressing the immediate concern of areas which have inversion layers. 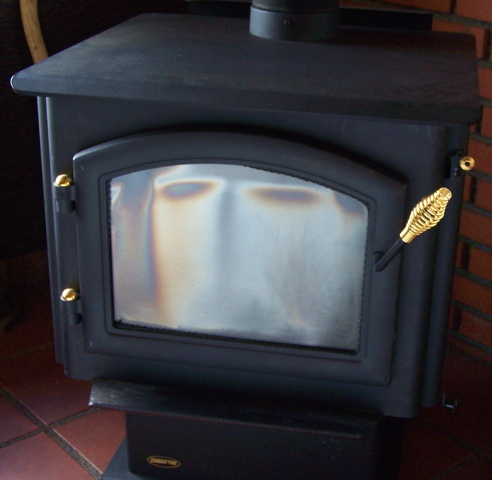 DVM: Under a four-year-old county ordinance, which you sponsored, homeowners in West Marin and other unincorporated parts of the county, by July 1 of this year have to replace their old woodstoves and fireplaces with EPA-approved units. Do you feel that should be sufficient to meet the Bay Area Air Quality Management District’s goals? Supervisor Kinsey: I believe that our ordinance has taken appropriate steps to meet the BAAQMD’s goals related to air quality impacts related to wood smoke. The county ordinance provided a five-year voluntary program, and the board provided a rebate program to financially help people who need to upgrade their wood stoves. Given that those who have only a wood-burning source for their heat are exempt from the BAAQMD ban during “Spare-the-Air” events, as long as they are using dry material for their fuel, I believe that our ordinance is consistent and adequate to meet BAAQMD goals. DVM: The main alternative to wood for heating in West Marin is propane, and it is derived from other petroleum products during oil or natural-gas processing. With the cost of natural gas expected to rise by 20 percent this year and the cost of oil already high and rising, wouldn’t this seem to be a bad time to be forcing people to burn more propane? Supervisor Kinsey: The proposed regulations do not force West Marin residents to switch to propane. Wood burning remains a viable option, although some homeowners will have to pay the price of converting to an EPA-certified stove. I agree that petroleum-based fuels will continue to become more expensive and have their own environmental consequences, even if their impacts occur remotely. Our board is strongly advocating the development of additional renewable energy capacity in our county, and I am very pleased with the operation and cost savings that I am realizing from my own photo-voltaic installation. DVM: Do you think the Air Quality Management District recognizes differences in rural, suburban, and urban wood heating? Should it? Supervisor Kinsey: The BAAQMD considers air quality to be a regional responsibility, and I doubt that they differentiate between remote, low-density communities and larger, more urban ones, because they recognize the interconnectedness of the atmosphere. Having said that, I also doubt that their enforcement activities will focus on the lower-density areas where problems and complaints will be fewer. I also think that by exempting wood-burning smoke when it is the sole source of heating for a residence is an acknowledgement that there are differences in the character of communities. I believe that we all live in the same fragile bubble, and that we are equally responsible for the quality of our air, whether we live in West Marin or an urban area. At the time that the Marin County ordinance was enacted, many local residents agreed with me, and some cited their own health problems related to smoke. That said, I also believe that when regulations are implemented the cost must be taken into account, and I applaud the Air District for proposing a rebate program, similar to Marin County’s rebate program, which will help people make the transition. DVM: Should the county ask the Air Management District to make exceptions for EPA-approved woodstoves? For homes in sparsely populated areas? For woodstoves not in the vicinity of bad-air-day problems? Supervisor Kinsey: For the reason mentioned above, I do not think that the Air Management District needs to make additional exceptions for low-density communities. DVM: In general, what should the County of Marin’s role be in all this? What position is the board taking? Supervisor Kinsey: Marin County seeks to be a leader in reducing health risks and climate change consequences related to pollution of our air. We were in the lead on requiring improvements to wood-burning appliances, without taking an arbitrary position of banning all woodstoves. We also have tried to ease the financial impact of change for individuals. I expect that our board will endorse the proposed regulations, but we will not take an active role in enforcing those regulations. Our objective has been, and will remain in a supportive role, to help homeowners convert their stoves and to meet the county code. In the upcoming county budget process, I will be requesting that my fellow supervisors support renewed funding for the county rebate program to help homeowners with the costs associated with conversion. I’m also suspicious when a politician says, “Don’t worry about this law I’m backing. In your case, it’ll never be enforced.” Either you have a bad law or a prediction you can’t count on. Supposedly, as long as you don’t have other ways to heat your house, you’ll be able to fire up EPA-approved woodstoves on “Spare the Air Days.” Of course, you won’t be able to do so if you have propane available — even if you can’t afford to use it. I like Supervisor Kinsey, but his citing the “interconnectedness of the atmosphere” and our all living “in the same fragile bubble” as arguments for restricting this coast’s woodstoves strikes me as a wondrous rhetorical leap — not empirical science. Although the official comment period on the Air District’s proposed woodstove restrictions expired back on Dec. 10 (well before most of the public was aware of them), readers can still email suggestions to district staff or directors at sparetheair@baaqmd.gov. Dave: I don’t know about the image on your stove looking like Jesus, but it does have a strong resemblence to the “Guardian Monkey” that protects the canoe houses on Palau in the Western Pacific. They are made of wood and come in different sizes. I will bring my small wooden image by so that you can see for yourself. unfortunatly due to the regulations that cities are passing i think that wood burning might just be something that we tell our grandkids that we used to be able to do.